On Der Backlog: More Movies Than You Can Stick A Shake At | "DESTROY ALL FANBOYS!" Gah. More stuff to review, but not review in a few cases where that homework was already done. I did a few of these already based off of TCM showing them during the wee hours, so I’ll only need to do five of eight. 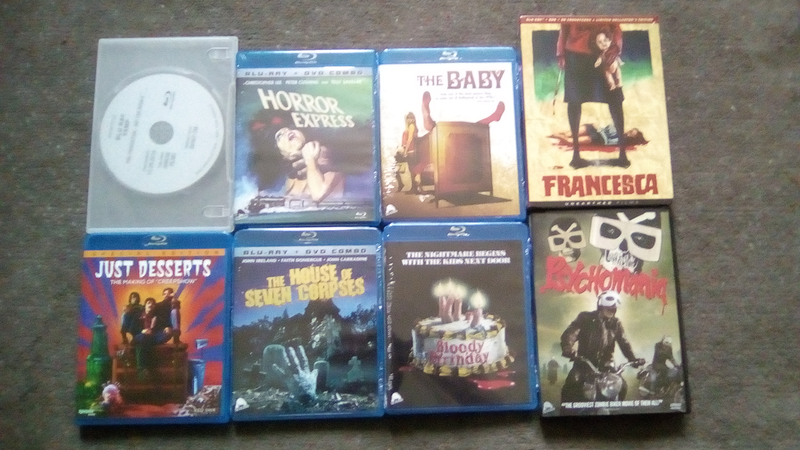 Five of these are from Severin Films’ big sale last month after their publishing rights expired for Horror Express, The Baby, Bloody Birthday, The House of Seven Corpses, and Psychomania. I actually thought I’d reviewed HotSC already, but can’t locate the review, so I guess it’s one I dreamed I wrote or something. No big deal, as I’ve seen this enough to tap out impressions in my sleep. Vamp is yet another Arrow Video screener I need to get to, Just Desserts I’ve seen already and need to write up (it’s brilliant), and MVD Visual sent over this lovely Unearthed Francesca set that includes a Blu-Ray/DVD and soundtrack from this recent retro giallo that, based on the trailer I just watched, REALLY looks as it was made in the 70’s. Anyway back in a bit with a review of something NOT here I think you’ll like. This entry was posted in 2016, Commentary, DAF, Features, Humor, Updates and tagged "B" Movies, 1970's, Arrow Video, Bloody Birthday, Blu-Ray/DVD, Coming Soon, Holiday Gift Guide 2016, Horror, Horror Express, Horror Films, Just Desserts, Mature, MVD Visual, Nostalgia, Not For The Kiddies!, Psychomania, Severin Films, Synapse Films, The Baby, The House of Seven Corpses, Unearthed Films, Vamp, Violence Is A Very Horrible Thing by geelw. Bookmark the permalink.